“This town owned us, that was the good and the bad of it. It knew every inch of us, every sin, every secret, every scab. Which was why most people never bothered to leave, and why the ones who did never came back. Before I met Lena that would have been me, five minutes after I graduated from Jackson High. Gone. Then I fell in love with a Caster girl. She showed me there was another world within the cracks of our uneven sidewalks. One that had been there all along, hidden in plain sight. Lena’s Gatlin was a place where things happened – impossible, supernatural, life-altering things. Lena’s been acting strange since Uncle Macon died. She seems to be moving further and further away from Ethan and nothing he does can fix it. He can see she’s falling apart at the seams but doesn’t understand the severity of it. He had to overcome the same misery and grief just a year ago when his own mother died. But then again, he doesn’t know the whole story; he doesn’t know why Lena thinks she was the reason for Macon’s death. He doesn’t know that he might have been in the same position if it weren’t for Lena. There are many things that Ethan doesn’t know. Including exactly how much of Lena’s Caster family has something to do with his mortal family, and how well Macon actually knew his mother. He is battling with his own questions whilst he tries to help Lena with hers, but unknowingly brings his best friend Link, and the new girl Liv, into this supernatural world with him when everything falls apart. 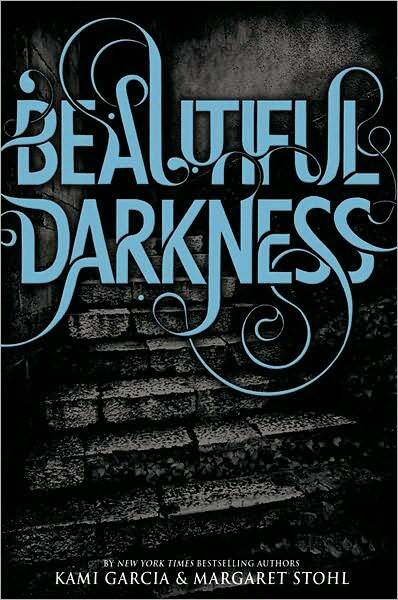 I Loved Beautiful Creatures so much and I couldn’t wait to read Beautiful Darkness so I got it as soon as I could! I had to know what happened after Lena’s birthday. I had to know what the seventeenth moon had in store for them. I had to know if they were going to live happily ever after! (I’m a romantic at heart!) What I didn’t realise was how much everything I wanted so badly would totally not be what happened at all and that this book would be even better than what I thought it would be! I kinda thought for some reason that this would be all about Ethan and Lena trying to work out how they were going to be together and stuff and I did think that could maybe get a bit boring but how wrong was I! I hated new guy, John Breed, from the second I saw him and with good reason! I won’t go further but I don’t think he’s a very nice character at all! With Lena acting all strange and being distant, it’s really no wonder that Ethan doesn’t know how to react when Liv comes onto the scene. I liked Liv, she is such a cool character and I was happy that there was at least one girl in the series who was awesome without being a supernatural (with the exception of Mirian of course!) I wasn’t really that surprised with Ethan’s reaction though, hes a 16 year old guy, but I’m happy about the way things panned out between them. The thing I loved about Beautiful Creatures was the descriptions and how even though the book was so long there weren’t any parts of it that I thought were overdone. Beautiful Darkness is very similar, in that the descriptions were so powerful and you really get a feel for the characters but I think the only bad thing I have to say about it is that repeats stuff a little bit too much, not over the top, but just a little too much. I understand that sometimes in a series you have to cover what happened in the previous books but I think it was a little over done here! Anyway, away from the negative! I loved the way that Beautiful Darkness really made you feel what Ethan was going through. Obviously I knew what had happened on Lena’s birthday but it was pretty obvious that Ethan didn’t have the full story from quite early on in the book. It was obvious that Ethan was also grieving for Macon while Lena was but also grieving for Lena because she was so different. I loved that Ethan never gave up on her though, even when he was faced with a pretty English girl like Liv, his feelings were a bit strange but he didn’t give up on Lena. I think the thing I like most about this series is the characters, the way that even though you are told the story through Ethan, you get such a feel for the others. Link is just awesome! He is totally the friend you want there with you through thick and thin, and still making jokes when the times are tough. I was so glad there was more of Link in this book than the first, and I really hope theres more of him in the next! A lot of this book was learning to cope with the things the world throws at you and even though it is a supernatural series the issues there are so real and human. Lena has to face the consequences of Darkness and Light, which impact on her family severely but let’s face it, who doesn’t have to face tough choices when they are 16, even if the consequences aren’t quite so terrible! Lena’s battle is a very strange one and for that her feelings are all twisted up. She doesn’t know who she is, so how can she choose what is the right decision? It’s no wonder that after what happened on her birthday she is so confused and thinks she is something she’s not. As I said, the description in this book is incredible. I love the power you feel seeping through the pages when Ethan and Lena kiss. I love the way you can hear the branches fall in the wood and see the water at the lake early on in the book, I love the magical way Lena’s hair is described when she’s about to cast, and I love that some of the things that happen later were terrifying even though in essence they were just words on a piece of paper! This is a re-published review of Beautiful Darkness; first reviewed on Readaraptor on 24th March 2011. I am following this post up with reviews of the rest of the series over the next few weeks in the run up to the release of a new series by the authors. Dangerous Creatures will feature Ridley and Link from this series and is available for pre-order via Amazon, the iBooks store and other retailers now.